Country singer charitable donations have slowed to a dribble in Nashville, possibly due to the closure of Progressive Printing. The company, who specialized in oversize novelty checks mounted on corrugated plastic or cardboard, was bought out by Exacraft Mail and Print Solutions in Brentwood and will be combined into that location in a few weeks. In the meantime, hospitals, homeless shelters, and other funds have seen sizable drops in their contributions. Charles Jones of "Toothbrushes for Arkansas" told us he expects donations to be down by 34% when figures come out in August. "It's the damnest thing," said Jones. 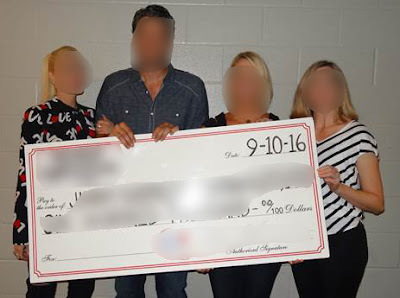 "I can't for the life of me figure out the connection between our drop-off and the lack of photo-op-ready, comically large, not actually cashable checks." Usually, somewhere between $900,000 and $3 million dollars are collected and given to nonprofit organizations by country music superstars during the months of June-August. Charity softball games, bake sales, and charity-specific concerts have been non-existent this summer. Some say the shortage of the showy, symbolic checks is to blame. "I've seen some social media posts saying that country singers won't give a dime to a relief center if there's not a camera on them," related Cherry Givens of "Kane Brown Fans Literacy Fund." "But I'm not that cynical… can you imagine?" John Reynolds, COO of "Guns for the Incarcerated" suggests country singers order their preposterously gigantic, camera-friendly checks from Amazon until Exacraft's check printing service is up and running.